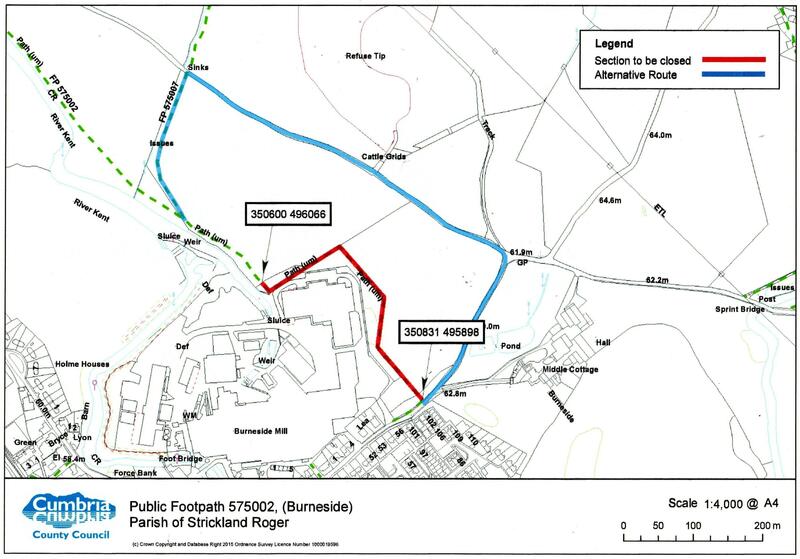 In the near future, improvements to the permissive path which is behind the wall down Hall Road, and the continuation of the Dales Way footpath alongside the Cropper Mill complex, means that these sections will be closed when the work begins. The closure will extend into the walking season. A simple diversion will be set up with the appropriate signage when this happens, which will cause minimum inconvenience. The path improvements are the combined results of consultations and financial contributions by Burneside Parish Council and Cumbria County Council, ably led by Countryside Ranger Geoff Fewkes. Other donors include the Dales Way Association, the Ramblers Association and Lakeland Hills Guest House, Burneside. The diversion for East to West Dales Way walkers starts at the North East corner of the blue line, i.e. a continuation, straight on, of Sprint Bridge Road. This entry was posted in Uncategorized on April 1, 2015 by Alex McManus (Footpaths).